More horses: Featuring the latest in Ford Racing Technology, Bullitt’s 4.6-liter V-8 delivers 315 horsepower and 325 pound-feet of torque. Sport-tuned: Modified chassis and suspension improves an already competent and capable chassis to deliver the most balanced Mustang ever. Film-inspired: Dark Highland Green exterior paint calls back the original movie car, while a specially mastered DVD helped Ford engineers deliver an exhaust note that matches the film. Mustang magic: Bullitt is the latest in a line of special editions that keep Mustang news fresh. Plus, it delivers on the Mustang tradition of unique products that fit customers’ individual preferences: a steed for every need. Bottom line: Bullitt carries on the Mustang tradition of affordable performance with a $31,075 Manufacturer’s Suggested Retail Price (MSRP). A limited production run of 7,700 units is planned. SAN FRANCISCO, Nov. 6 – Four decades after hitting the big screen and redefining the on-screen car chase, the Ford Mustang Bullitt returns to the streets in 2008, blending the best Mustang ever with the latest Ford Racing technology. This modern classic delivers a balance of power and performance, thanks to special chassis and suspension tweaks as well as the 315 horsepower and 325 pound-feet of torque that Bullitt delivers through its 4.6-liter V-8 engine. The 2008 Bullitt arrives in dealers early next year, with a starting MSRP of $31,075 (including destination and delivery) and limited production of 7,700 units for the U.S. and Canada. The launch of the limited edition 2008 Mustang Bullitt coincides with the 40th anniversary of the release of the Warner Bros. Pictures film that gave the original car its name. In the movie, legendary actor Steve McQueen drove a Dark Highland Green 1968 Mustang GT that gained cult status among Mustang enthusiasts, thanks to a seven-minute scene that film and car buffs believe defined the modern movie car chase. Ford engineers modified the 2008 Mustang Bullitt’s chassis and suspension to fine-tune handling and ensure the extra horsepower and torque from the 4.6-liter V-8 is put to good use. The live rear axle uses a unique 3.73:1 gear that helps launch the Bullitt with vigor. Stock Mustang GT shocks and struts were swapped out for new units that allowed engineers to dial in a more aggressive driving dynamic while still maintaining the outstanding ride and balance of the base Mustang GT. A tower-to-tower brace designed specifically for the Bullitt lends additional torsional and lateral stiffness to the chassis for improved cornering and holds a unique serial number for each Bullitt. The brakes also have been improved versus the base Mustang GT’s. More aggressive front pads were developed specifically for Bullitt and improve fade resistance and pedal feel. The 2008 Mustang Bullitt wears unique cast-aluminum Euroflange wheels, offering a modern twist on the original movie car. The Dark Argent Gray spokes feature a satin finish, while a bright-machined lip completes the look. Calipers are colored to match the wheel. The wheels are wrapped in the same P235/50ZR 18 BF Goodrich g-Force T/A KDWS tires used on Mustangs at the Ford Racing High Performance Driving School at Miller Motorsports Park in Utah. Bullitt packs firepower under the hood. The 4.6-liter, 3-valve V-8 delivers 315 horsepower at 6,000 rpm and 325 pound-feet of torque at 4,250 rpm. Engine calibration is designed to increase throttle response for a snappier acceleration feel. The redline has been boosted by 250 rpm to 6,500, with top-end speed bumped to 151 miles-per-hour. Gears are selected via a Tremec 5-speed manual transmission, and the shifter is topped with a polished aluminum shift ball designed specifically for the 2008 Bullitt. 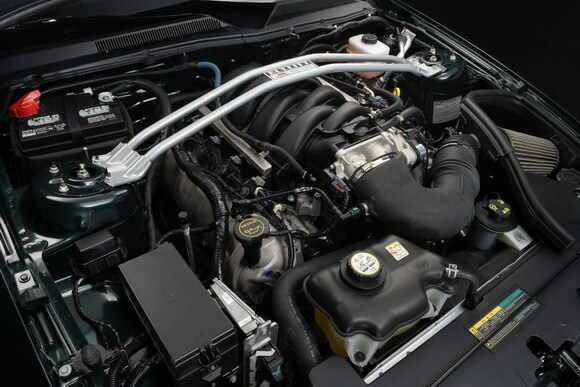 The car features the first use of an open-element air filter in a factory-produced, fuel-injected Mustang. Inspired by Ford Racing, the intake is tucked neatly behind the driver side headlamp, mounted in an air box that was tooled up specifically for the Mustang. The hood liner was extensively modified to provide a full seal to the air box, ensuring that the engine is fed a steady diet of cooler air. Engine performance is further enhanced through the use of an innovative adaptive spark ignition system, new for the 2008 Mustang. The system can sense, within a few seconds, what type of fuel is being injected into the motor and adjusts the spark to provide maximum torque at any given speed – and as much as 10 pounds-feet more between 1,000 and 4,000 rpm. Bullitt can run on either premium or regular fuel. Ford recommends premium fuel for optimum performance, but the adaptive spark ignition will adjust the spark to burn regular fuel without damaging the engine. The custom-designed exhaust system continues Mustang’s traditional use of a true dual-exhaust system with a new H-pipe specifically developed for Bullitt. The all-new mufflers, featuring larger 3.5-inch chrome tips (versus the 3-inch tips on the standard Mustang GT) are tuned to minimize backpressure, maximize horsepower and provide the Bullitt with its powerful exhaust note. The original 1968 Mustang’s stealth-like appearance wasn’t necessarily intentional. In typical Hollywood fashion, the movie crew removed all exterior badges and logos from the car – including the iconic pony badge on the grille. The 2008 Mustang Bullitt calls back the original movie car in painstaking detail – right down to the dark green paint and lack of exterior badges, scoops and spoilers. The only visible identification is the word “Bullitt” dropped into a gun-sight graphic in the center of the faux gas cap on the decklid. The new Bullitt wears a close match to the movie car’s 1968 Highland Green paint, officially called Dark Highland Green. 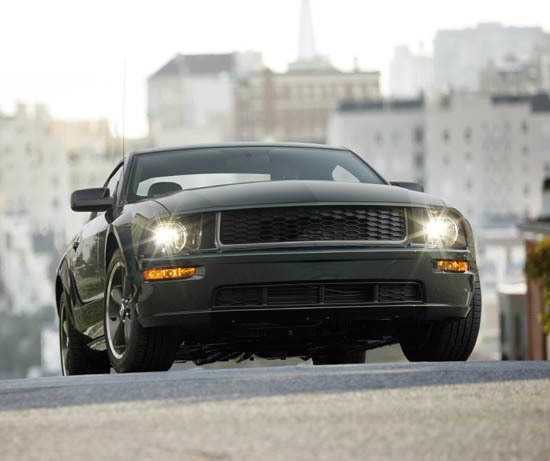 This distinctive color has only graced one other Mustang, the 2001 Mustang Bullitt. Gaffka assures Bullitt enthusiasts that the color will remain an exclusive Mustang Bullitt color. Non-purists can opt for only one other color – black. The Mustang Bullitt uses the standard Mustang GT’s front fascia. A new black-mesh grille is devoid of the standard chrome pony and is accented by a satin aluminum strip that represents the chrome grille surround on the 1968 car. The rear fascia also is shared with the standard Mustang GT and houses Bullitt’s unique dual exhaust tips. Dark Argent Gray painted brake calipers closely match the wheel spokes, while staying true to the original. The interior is pure Mustang Bullitt, understated and dressed in Charcoal Black leather and Satin metallic trim. The centerpiece of the interior is the hand-machined, aluminum swirl dash panel appliqué. Satin aluminum bezels circle the air vents and gauges, complementing a satin aluminum shift ball that replaces the standard leather-wrapped shifter on the Mustang GT. The pedals wear race-inspired aluminum covers that further reinforce Bullitt’s performance intentions. The interior is graphically clean. The only identifying marks visible inside Bullitt are the logo and gun-sight graphic mounted in the center of the leather-wrapped steering wheel and the word “Bullitt” embossed into the metal sill plates. The Dark Charcoal leather seats pick up the diamond perforation inserts from the base Mustang GT. The seats are patterned after those in the Shelby GT500 providing added lumbar and bolster support. The seats are constructed using the new soy-based foam developed by Ford and introduced on the 2008 Mustang. The soy foam, made up of 24 percent renewable content, is produced through a process that requires less energy and emits less CO2. The 2008 Mustang Bullitt will be built at AutoAlliance International in Flat Rock, Mich. It goes on sale early next year.It goes on sale early next year. Press materials and visuals of the new 2008 Mustang Bullitt are available at www.media.ford.com. Ford Motor Company, a global automotive industry leader based in Dearborn, Mich., manufactures or distributes automobiles in 200 markets across six continents. With about 260,000 employees and about 100 plants worldwide, the company’s core and affiliated automotive brands include Ford, Jaguar, Land Rover, Lincoln, Mercury, Volvo and Mazda. The company provides financial services through Ford Motor Credit Company. For more information regarding Ford’s products, please visit www.fordvehicles.com. Angie Kozleski / Ford Motor Co.
Whitney E Drake / Ford Motor Co.
Watch the videos of both Bullitts from the classic car chase and a video produced by Edmund’s Inside Line. Hi folks, is there anybody out there that could tell me if a tall guy like me, 6 feet 8 inches, can fit in a Ford mustang bullit 2008?